This one is a little tricky. Firstly because it feels like I'm just stating the obvious – who doesn't want to create an awesome product? Secondly because it's hard to offer a lot of useful advice in a blog post on a topic which shelves of books have been written about. 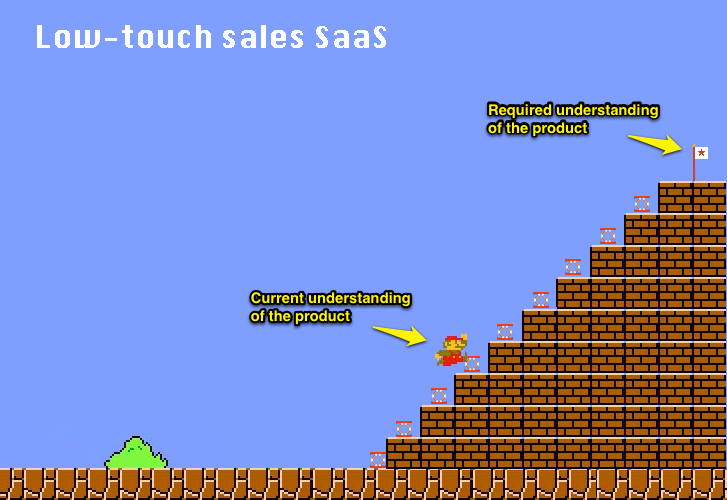 But a series on the DOs for SaaS startups would be incomplete without at least one DO about the product I and will focus on a few aspects that I personally feel strongly about. 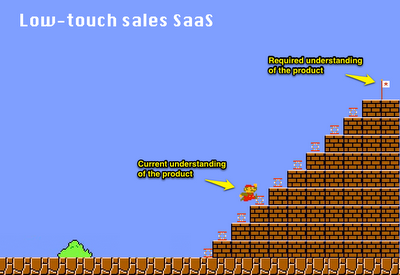 As mentioned before, I'm going to assume that you want to build a modern SaaS solution for the "Fortune 5,000,000". This most likely means that you won't have a field sales force and that you're going to use a low-touch online sales model instead. What implications does this have for your product? The entire user experience – from the first time the user visits your site to the moment he signs up for a free trial, through the onboarding and the exploration of the product and further on – needs to be completely frictionless. It should be designed with the same mindset that designers of online shops have, e.g. when they design a checkout process: Any little thing that doesn't work flawlessly, anything that may make the user doubt can kill a few conversion percentage points. If your product is complex, and chances are that your product will have significant complexity at least from a new user's point of view, hide a big part of the complexity from the new user and give him or her a way to gradually discover it. When you have the user's attention, you have to fight to keep it against a million possible distractions. Make the learning curve as smooth as possible and give the user as much gratification along the way as possible. The masters of this discipline are designers of games that teach the game to new users in many small steps, meticulously making sure that it never gets too difficult nor boring, giving the user lots of little gratifications along the way. 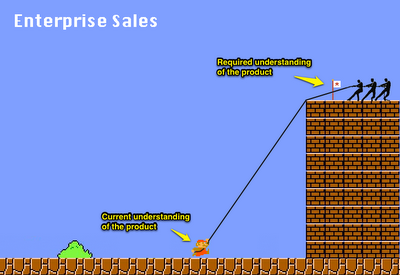 Poor Mario is faced with an insurmountable barrier, and it takes the vendor's sales and support team (those little guys on the right) to pull him up that mountain, which means lots of money and time spent on sales, setup and training – and a lot of time and reasons for Mario to give up before reaching the flag. Online shops, games, instant gratification, gradual discovery – by now you can probably guess the bigger theme that I'm heading at: The consumerization of enterprise software. The consumerization of enterprise software means that the way enterprises buy software is changing. Keep that in mind – you're not developing a product for IT professionals (unless you are offering a product to the IT team) who are super tech savvy and will make a choice based on a feature matrix. Your product will be used by marketing, sales, HR, support or finance people or founders or managers of small businesses – whatever the case may be – and your product must be easy enough to use so that a typical member of your target group can come to your site, start a trial and see the value of your product with little to no intervention from your company. * Thanks to Roan Lavery of FreeAgent, whose presentation at out recent SaaS Founder Meetup was the inspiration for the images above. Point Nine not only loves animals, we also love dog food. After all, some months ago we invested in ePetWorld, which runs hundeland.de, a fast-growing online shop for dog food and supplies. Today I'm going to talk about a different type of dog food though. If you know us a bit you'll know that we talk a lot about the Cloud. In our opinion, the move of software from the desktop or local servers to the Cloud, along with the consumerization of enterprise software and other developments that go hand in hand with it, truly is a revolution. Like in any revolution there will be casualties, in this case incumbents that aren't fast enough to adapt to the new realities, but fortunately it'a a peaceful revolution which only puts bad UIs, overpriced software maintenance contracts and "call us for a demo" websites under the guillotine. And like in any revolution there will be new rulers – startups that drive the Cloud revolution and attract tens of thousands of customers within few years. Our goal at Point Nine is to find some of these revolutionaries at an early stage and back them on their way from the bottom to the top. Back to the dog food. We run Point Nine mostly using Cloud apps, and it tastes pretty darn good. I wrote about the idea of going "Office free" about seven years ago. Today we're using Google Drive (plus Basecamp) for 90% of our documents and spreadsheets, and ironically that's not because Google Documents and Google Spreadsheets are particularly good products. In fact I think they are pretty bad, and I'm amazed how slowly Google has been developing them if you consider that they were launched many years ago already. But the fact that Google makes it dead simple to collaborate on documents and spreadsheets, this one USP over desktop software, is such a compelling argument that we happily accept all of the products' shortcomings (makes me wonder, by the way, if there could be an interesting opportunity in building a better online version of Word and Excel). While we're heavy users of Google Docs, Google Spreadsheets and Basecamp, by far the most important application for us is Zendesk 1, which we use for deal-tracking 2. It's our life blood, and I don't know how we'd survive without it. While Zendesk has of course been built for a different use case – customer service –, and Mikkel might kill me if he sees how we're using Zendesk, it turned out that because of its adaptability it works perfectly well for our needs. For us, every new potential investment becomes a "ticket", and we use Zendesk from our first encounter with a new company through the entire assessment of the deal up until we either decide to pass (about 99% of the time) or to invest (about 1% of the time, in which case Basecamp takes over, since we set up a Basecamp project for every investment to collect updates, notes, etc). Every email that we receive at submit@pointninecap.com is automatically turned into a Zendesk ticket and gets assigned to Fabian, with the stage automatically being set to "evaluating". Fabian and Nicolas then do some initial research and add things like slides, spreadsheets (ouch, you got me) or call notes to the ticket. Once Fabian and Nicolas have made up their minds they assign the ticket to Pawel or me and set the stage to "Recommendation: Evaluate further" or "Recommendation: Pass". This makes the ticket appear in the respective view/filter for Pawel and me. It happens very often that we talk to a startup which looks interesting but isn't ready for an investment yet. Zendesk makes it easy to keep track of these opportunities. We simply set the stage to "Follow-up in 3 months" or "Follow-up in 6 months". After three or six months, Zendesk automatically sets the stage to "Take another look" and sends us an email notification. Zendesk makes it easy to stay up-to-date on everything since you'll get an email notification whenever a ticket is updated. You can reply directly to those emails to add comments to the ticket (as well as create new tickets by emailing them in), plus there are great apps for the iPad and the iPhone, so it's convenient to work on tickets on the go. Finally, you can use tags or custom fields to collect additional information about tickets. We are, for example, tracking deal sources and company locations, which is helpful for analyses that we're going to do in the future. 1 In case you don't know yet: Disclosure, I'm an investor in Zendesk. 2 Dear founders, sorry to call your startup a "deal". That's VC speak and I hope it doesn't sound too disrespectful.